What does the term "favorite" mean as it applies to the game of poker? 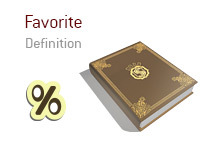 What is the definition of the term "favorite"? In poker, a "favorite" is the person who is statistically favored to win a hand. For instance, let's say that you are dealt Ac-Ah on the button. Action folds around to you, you raise, the SB folds and the BB calls. The flop comes As-8s-Kh. The BB leads out with a bet, you re-raise, he pushes all-in and you call. You turn over your top set, while your opponent flips over 7s-5s for a flush draw. After the flop, you are the "favorite" (statistical favorite) to win the hand. However, your opponent could still win the hand. The turn brings the 3s. Now your opponent is the "favorite" to win the hand, though you still have "outs" in the form of the remaining Ace in the deck, any Eight, any King or any Three. The turn brings the 3h, and you take down the pot with your Full House. In the hand listed above, you were the favorite pre-flop, after the flop and after the River. Your opponent was a favorite after the turn card gave him a flush, though you still had a number of "outs" to win the hand.